“Yesterday was a good day for our nation’s geothermal innovators as we are one step closer to streamlining the environmental review process for their exploration efforts. Nevada is leading the charge in the United States’ ‘all-of-the-above’ energy strategy, and this legislation ensures we remain at the top,” said Senator Dean Heller. Construction of a 7.5- 8 MW geothermal plant is to begin in 2016. 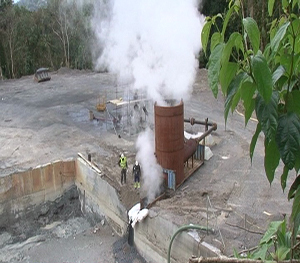 The next step for Dominica’s renowned geothermal plant project is expected to begin within this financial year. So far one production well and two re-injection wells have been established. The Hon. Finance Minister told the nation in his budget address that in the meantime, the legal framework is being developed. He said, “Within the next two months, we expect to conclude negotiations with a French investment consortium, who are partnering with us in a joint venture, to build and operate the domestic plant, and the plant to export electricity to Guadeloupe and Martinique. REFF-West is the premier West Coast renewable energy finance event, uniting senior financiers, investors, and renewable energy executives from across the country since 2008. With a focus on renewable energy development in the Western U.S., REFF-West will highlight financing trends for renewable power, clean technologies, and transportation; assess the future of federal and state policy and the role of financing innovations; identify early-stage investment opportunities; and discuss the region’s role in the international renewable energy marketplace. The conference also offers unparalleled networking opportunities, allowing you to meet senior representatives from both the energy and financial sectors. Using geothermal resources can provide economic development opportunities for countries in the form of energy savings, taxes, royalties, technology export, and jobs. The GeoDH project co-funded by the Intelligent Energy Europe Programme drafted recommendations on how to overcome administrative, legal and financial barriers including a shared know-how transfer based on best practices. This detailed Fact Sheet includes the main outputs of the project, the evaluation of market barriers and regulations, links on project management and financing, training material, business models for geothermal district heating as well as s summary of the EU’s contribution. Mighty River Power and Tauhara North No.2 Trust mark the installation of a new turbine at the Nga Awa Purua geothermal power station this week with a blessing. The 138 MW plant operated by Mighty River Power under a joint venture (65%/35%) with the Trust produces enough renewable energy to power around 140,000 homes – the equivalent of every home in Taupo, Rotorua, Hamilton and Tauranga. It is the largest single-shaft geothermal turbine in the world, weighing 62 tonnes and is 8.7 meters long. The ministry of finance and energy was on Thursday due to present the findings from the geology, geophysics and geochemistry surveys (3Gs surveys) that were undertaken in Grenada earlier this year with the assistance of the government of New Zealand. A New Zealand company, Jacobs New Zealand Ltd, was contracted by the government of New Zealand to execute the terms of reference of the contract. Alastair Brooks, the Caribbean geothermal advisor and Jacobs’ representative, is the head of this initiative and provided overall direction for the studies. The Grenada survey comprised of three main focus areas namely: geological survey; geochemical survey; and geophysical survey. The investigation was completed to a high standard, typical of the international geothermal industry practice for a pre-drilling surface exploration program. The results indicate the presence of a considerable (4 – 8km2), high-temperature resource (200°C to 290°C) located north of Mount Saint Catherine. Thursday’s discussions were also set out a road map for the development of Grenada’s geothermal potential. The Chinese government is interested in investing in foreign alternative energy, and a geothermal project in the Canoe Reach, just south of Valemount, might fit the bill. “It’s an exciting new opportunity,” says Craig Dunn, though he admits he’s stopped getting too excited about interim discussions, and this one is preliminary so far. Dunn is the chief geologist and spokesperson for Borealis Geopower, the Calgary-based company that has been doing leading-edge science and non-invasive exploration of the Canoe Reach to try to determine the best place to drill in order to generate electricity using geothermal heat. The company has been approached by a Canadian branch of the China Overseas Investment Union (COIU) that is interested in investing in a geothermal power project in BC. The Japanese Environment Ministry said it will lift restrictions on drilling operations underneath national parks and quasi-national parks to make 70 percent of geothermal energy reserves in Japan available for development. An expert panel of the ministry on July 30 approved the plan to attain more renewable energy sources. The ministry plans to issue an official notification in autumn. The new guidelines will allow geothermal development of Class 1 Special Zones, or areas within Japanese national parks that require significant preservation efforts. Development within Special Protection Zones, the most heavily restricted of national park areas, will remain prohibited. But geothermal power resources underneath Class 1 Special Zones can only be tapped through buildings constructed outside these areas. Operators will be able to drill diagonally from outside the zones to reach the geothermal reservoirs. Mobilizing private finance, though, can be difficult for geothermal power projects, which face high resource risks and low utility returns. Developers traditionally respond with a phased approach, financing power generation units one at a time as resources are proved. This typically translates to higher overall transaction costs for debt financing compared to larger ventures. The 320 megawatt Sarulla Geothermal Power Development Project in North Sumatra tackled this challenge by capturing the economies of scale through a single-stage financing of three power generation units and all the associated wells. The landmark project is the key to demonstrating geothermal commercial viability in Indonesia and reigniting interest in clean energy investment. The Geothermal Resources Council (GRC) has made available the latest GRC Bulletin, the definitive voice of the global geothermal energy industry, published continuously since 1972. The GRC has generously provided 3 pages from the latest issue for free. However, the full issue is 48 pages! 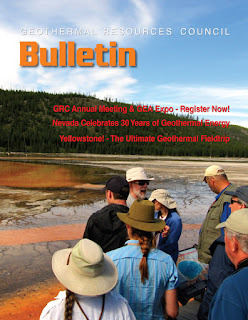 In this issue, there is a preview of the GRC Annual Meeting & GEA Expo, 14 pages of geothermal news from around the world, an overview of geothermal energy in Nevada and a photo essay of a GRC Workshop/Fieldtrip to Yellowstone National Park. After three days of debate, the U.S. Senate Energy and Natural Resources Committee voted Thursday to approve its attempt at the first broad energy policy reform bill in eight years. The Energy Policy Modernization Act of 2015 passed by a vote of 18-4 after the panel approved various bipartisan amendments but rejected others that did not have wide support. The bill includes a number of policy priorities from both Republicans and Democrats and came as a result of months of negotiations, meetings outreach and other activities aimed at a truly bipartisan bill. The Energy Policy Modernization Act of 2015, introduced last week features five titles reflecting common ground on energy efficiency, infrastructure, supply, accountability, and land conservation. In the supply title, it includes several provisions supporting geothermal energy including setting a 50,000 MW National Geothermal Goal. The Japan Oil, Gas and Metals National Corp (JOGMEC) will provide 24.99% of the required financing for the exploration work as part of an up-to-7-MW geothermal project in Iwate prefecture in fiscal 2015. Under the terms of the deal, JOGMEC may take as much as a 50% stake in the project, Japan’s Ministry of Economy, Trade and Industry (METI) said in a statement on Monday. The funding will be given to Iwate Geothermal Power Co Ltd, which is the entity in charge of exploring and developing the resources in the Matsuo Hachimantai area. Previously, the firm has carried out a research project there. JOGMEC falls under the jurisdiction of METI. Since September 2014, it has been supporting the domestic geothermal sector through research subsidies and a liability guarantee, yet the current contract marks its first direct investment in such a project, according to the press release. A U.S. Justice Department investigation into airline collusion, sinking fuel costs and softer demand could push domestic airfares to record lows next month. Registration is now open for the biggest annual geothermal event of the year. The GRC Annual Meeting & GEA Geothermal Energy Expo will bring together geothermal companies, academics, financiers, policy leaders, students, and other individuals to attend or exhibit at the event, to be held from September 20-23 at the Peppermill Resort Spa Casino, Reno, Nevada, USA. drive from the Peppermill Resort Spa Casino. 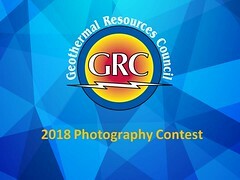 The Geothermal Resources Council (GRC), one of the world’s premier geothermal associations, has announced awards honoring the best and brightest of the global geothermal energy community. These prestigious awards have been a highlight of the geothermal calendar since the late 1970's. The GRC will present the prestigious Aidlin, Pioneer, Henry J Ramey Jr., Ben Holt, and Special Achievement awards at its Annual Membership Meeting & Awards Luncheon, the climax to the GRC Annual Meeting, at the Peppermill Resort Spa Casino on Wednesday, September 23. "The recipients of these awards have a lifetime of achievement in the geothermal academic, scientific and commercial communities", said GRC Executive Director Steve Ponder. "The GRC Awards recognizes the contributions of these individuals to educational institutions and geothermal developments around the world". For lifetime contributions to geothermal exploration and development worldwide and exceptional commitment to GRC. For lifetime achievements in geothermal studies in the Andes and for educating generations of geothermal scientists in Latin America. For seminal contributions to the modeling of hydraulic stimulation of EGS reservoirs and fluid flow in fractured media, and for mentoring the next generation of geothermal reservoir engineers. For lifetime achievement and innovation in geothermal power plant and process design. For unparalleled contributions to geothermal education and development worldwide, through the Stanford Workshops, World Geothermal Congress, and his leadership and commitment to the International geothermal Association (IGA) and GRC. For lifetime commitments to education and research, efforts that influenced much of Asia Pacific's geothermal development. For significant global contributions to geothermal mapping and field work for over 40 years. For more information about the GRC Annual Meeting & GEA Geothermal Energy Expo at the Peppermill Resort Spa Casino, http://www.geothermal.org/meet-new.html, Nevada, USA visit www.geothermal.org or call (530) 758-2360. 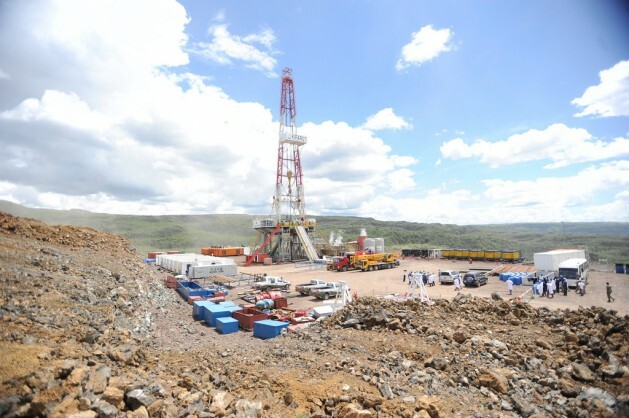 The 70 MW Akiira I project developed by Akiira Geothermal Limited (AGL), will soon start drilling after the company received insurance coverage for the exploratory phase of the initiative from Germany-based insurer Munich Re. The initial stages of geothermal exploration can be the most risky, with costly investment sometimes being lost when drilled areas do not produce enough steam or heat, causing projects to be discontinued. However, the "multi-well exploration risk insurance" offered by Munich Re is designed to mitigate some of the risk associated with the projects' early stage, allowing drilling to get underway. Hezy Ram, chief executive of Ram Energy, one of the founding shareholders of AGL, said the new project could prove strategically significant for the country. "Geothermal heat offers an immense reservoir of base load energy," he said. "Akiira will be a pilot project for us, so that other projects can follow." Akiira One is jointly owned by Centum and Frontier Investment Management, a Danish investment firm. Ram Energy, Inc. and Marine Power will construct the power plant. Gene Rush, retired geologist and now a Salida resident, will talk on “Geothermal Energy”. With mounting evidence of climate change associated with the use of petroleum-based energy products, the search for alternative energy sources continues. A vast amount of heat is trapped within the earth, and under the right conditions it can be tapped as an alternative source of clean and sustainable energy. Resources of geothermal energy range from the shallow ground to hot water and hot rock found a few miles beneath the Earth's surface, and even deeper, down to the extremely high temperatures of molten rock called magma. Mr. Rush’s talk will examine the earth from a geothermal perspective, the distribution of geothermal energy in the earth, geothermal sites and areas of interest in the US, and prospects for future development of geothermal energy resources. Governor David Ige signed a bill on June 8 pledging that Hawaii will become completely energy self-sustaining by 2045. If the government follows through, geothermal energy from volcanoes will play a big role. The state has 30 years to pull off its plan. About half of Hawaiians think their government can achieve its goal, Dawn Lippert, director of the Energy Excelerator in Hawaii, told Tech Insider. The other half isn't so sure. When geothermal is done right, it's an incredible resource — especially for a volcanically active place like Hawaii. Renewable energy companies are eager to tap into Mauna Loa, a giant volcano in the center of the Big Island that's near several volcanic hot spots. Mme Segolene Royal the minister for Ecology, Sustainable Development and Energy in the government of France is on an official visit in Iceland upon the invitation of Icelandic Foreign Minister Gunnar Bragi Sveinsson and Minister for Industry and Trade Ragnheidur Elin Arnadottir. During the minister’s visit in Iceland, the Iceland Geothermal Cluster Initiative and its sister organization in France GEODEEP signed an agreement to cooperate in creating a framework of standardized model licenses for exploring, realizing, and developing geothermal energy resources. This agreement is a landmark signing between the two clusters and could be used to create a general consensus for developing geothermal projects worldwide. 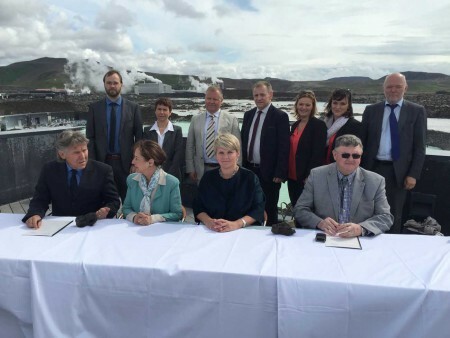 The Chairman of Iceland Geothermal Mr. Albert Albertsson – and Mr. Sylvain Broglie, Vice President of Marketing with GEODEEP, signed the agreement at the Blue Lagoon. In a bid to push for cleaner and greener energy sources in Mindanao, key regional government agencies involved in the permitting process of renewable energy (RE) projects have expressed commitment to accelerate processing and updating of RE project applications in various regions on the island. This commitment was obtained during a recent regional rounds made by the Mindanao Development Authority (Minda) to provide operational updates on the implementation of the One Stop Facilitation and Monitoring Center (OSFMC), a web-based portal for tracking RE applications in Mindanao. Launched in October last year, the OSFMC web portal was designed to effectively monitor and update the status as well as facilitate the speedy processing of the pending RE project applications in Mindanao. According to Minda, of the total power project applications, eight are geothermal energy power projects with a combined potential capacity of 278.48 MW. Only 32% of the Kenyan population is connected to the grid, and high electricity bills and unreliable supply have scared away investors, according to the government. Kenya Power has 2,211 megawatts of installed capacity, of which 37.6% is hydro power, 27.3% geothermal and 32.9% fossil thermal capacity. However, geothermal provided 46.4% of the 780.98 GW per hour generation in June 2015 while hydro and thermal contributed 38.1% and 14.8%, respectively, the statement said. Ethiopia’s government signed a deal to buy electricity from Corbetti geothermal-power plant being developed by companies including Reykjavik Geothermal Ltd. of Iceland, a partner in the project. Developing the first 20 megawatts of power output at Corbetti will cost $100 million, all of which will come from Reykjavik, Icelandic Drilling Co. and the African Renewable Energy Fund managed by Berkeley, said Edward Njoroge, chairman of the Corbetti Geothermal Power project. A total of $2 billion is required for generation of the full 500 megawatts, which is expected to be completed by about 2023, he said. The tariff agreed with the government is “actually tight for us, but we think we can do it,” Njoroge said. The cost of electricity from geothermal projects in Kenya, Africa’s biggest producer of power from steam, is about 8.5 U.S. cents to 9 U.S. cents per kilowatt hour, he said. U.S. advisers supported negotiations on the tariff via the Power Africa program, which seeks to boost access to electricity on the continent. The DOE is looking for a potential 40 to 50 MW for its low-enthalpy project. Two areas that have high potential to become geothermal facilities have been identified by the Philippines Department of Energy (DOE). Mario Marasigan, director of the DOE’s Renewable Energy Management Bureau (REMB), said these areas are Balut Island in Davao del Sur and Tingloy Island in Batangas. He said the REMB is continuously doing potential resource assessment that could be offered in the next Open Competitive and Selection Process (OCSP) for hydro and geothermal power. The DOE is looking for a potential 40 to 50 megawatts (MW) for its low-enthalpy project. IID released a new framework document that provides a comprehensive vision and specific actions in support of its Salton Sea Restoration and Renewable Energy Initiative. 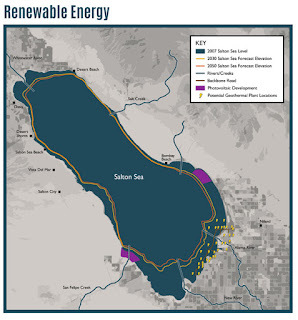 In taking the next steps to avert the impending demise of the Salton Sea, eventual public health crisis and spur carbon-free energy development for California, the Imperial Irrigation District Board of Directors has released a new framework document that provides a comprehensive vision and specific actions in support of its Salton Sea Restoration and Renewable Energy Initiative. A joint effort between IID and Imperial County, the initiative is a multiphased approach to Salton Sea restoration – the first phase being the development of a plan for an incremental restoration approach that will bridge the gap between current conditions and longer-range Salton Sea restoration planning measures. The new price tag for restoring the Salton Sea: $3.15 billion. That’s how much money local officials now say they want from California, as detailed in a plan approved Tuesday by the Imperial Irrigation District (IID)’s board of directors. It’s less expensive than a $9 billion plan that died in the state Legislature, and local officials hope it will pressure state officials to live up to their promise to restore the lake. The $3.15 billion would fund shovel-ready pilot projects and new geothermal energy development around the Salton Sea, California’s largest lake. The money would come from several sources, including fees from companies that emit planet-warming greenhouse gases and the $7.5 billion water bond that voters approved in November. Much of the money would go toward boosting geothermal energy development. The lake is home to one of the world’s most potent geothermal reservoirs, and local officials have long seen new development as a source of royalty payments to fund long-term restoration. New geothermal plants would also suppress dust by covering exposed lakebed, not to mention contribute to California’s ambitious clean energy goals. A tripling of Ngawha power station's 25 MW output could make the Far North self-sufficient in electricity and create up to 200 new jobs, a Top Energy boss says. The expansion, if it goes ahead, could also allow Far Northerners to avoid a hefty price hike proposed by the Electricity Authority to pay for national power infrastructure. Top Energy is applying for a raft of consents from the Northland Regional and Far North District councils for its plans to build two new geothermal power plants at Ngawha, east of Kaikohe. Each new plant would generate 25 megawatts, as much as the two existing plants combined. The total 75 MW produced would make the Far North an electricity exporter because even at peak demand the district consumes just 70 MW. The consent hearing will be held at Kingston House in Kerikeri on August 10 and 14. Top Energy is likely to use Ormat that designed the first two plants, though that will depend on price because it is no longer the only producer of power plants suitable for Ngawha's conditions. The Indonesia Geothermal Association (INAGA) in cooperation with the Geothermal Resources Council (GRC) will again conduct a special workshop before the Indonesian International Geothermal Convention & Exhibition (IIGCE 2015) meeting. “A Geothermal Conceptual Model & Well Targeting"
"A Geothermal Medium Enthalpy Management”. Chun Chin, P.E., Senior Project Manager POWER Engineers Inc.
Kevin Wallace, P.E., Senior Project Manager POWER Engineers Inc.
Gene Suemnicht, CEO, Chief Geologist EGS Inc. PLEASE REGISTER BY AUGUST 12 AT THE LATEST. Enel Green Power has started construction of the first geothermal plant in South America at Cerro Pabellón, in the Antofagasta region in Chile. The plant at Cerro Pabellón, in the municipality of Ollagüe, will set a double record for Enel Group’s green company: not only will it be the first geothermal plant in South America, but also the first one to be built at 4,500 meters above sea level. The construction of this facility started on 14 July 2015, after EGP signed a contract with Empresa Nacional del Petróleo (ENAP), the Chilean state company that operates in the hydrocarbon sector. Works will be completed in early 2017 with a total investment of around 320 million US dollars, financed through resources provided by the Enel Green Power. The technologies that will be transferred to Chile include the cutting-edge drilling system called HH300 that was recently installed in Italy, at Larderello. HH300 is a highly automated hydraulic machine that has an installed capacity of 4 MW and 272 tonnes of hook load capacity and can drill up to 5,000 meters deep into the ground. The drilling structure has a new loading system and uses longer drilling pipes, thus reducing maneuver time and supply costs, achieving an innovative pipe racking management and adding new service platforms. This machine produces evident benefits in terms of safety for operating personnel, efficiency and environmental improvements, since with the same impact and a careful and focused environmental integration, better performances are achieved, while maintaining the balance of the renewable geothermal cycle. The Deloitte Energy Excellence Awards provide an annual opportunity to recognize excellence and achievement across the electricity, oil, gas and petroleum industries. Geothermal energy, as the biggest renewable energy producer in New Zealand, is well represented in the nominations. Contact Energy is in the running for Energy Project of the Year for it's Wairākei Investment Programme that includes the 166 MWe Te Mihi geothermal power station. In the Community Initiative Of The Year category Mighty River Power and Tauhara North No.2 Trust - Mauri Waiariki are nominated for their "Harnessing the life force of geothermal energy for community good" campaign. Mike Dunstall, a GRC Member, General Manager Geothermal Resources and Development at Contact Energy is nominated for Energy Executive Of The Year. The award winners will be announced 12 August at the Langham Hotel, 83 Symonds Street, Auckland 1010, New Zealand. The main global barrier to geothermal power’s growth is not limited resources, or questions about heat, reliability, or sustainability. The barrier is instead a question of risk. How can government agencies and private companies reduce upfront risk of geothermal exploration with technology and public policy so that new geothermal resources can be discovered and built into power plants? Many in government agencies, donor banks, and companies in the private sector are taking steps in the right direction to address these risks. While Kenya makes a low net contribution to global greenhouse gas (GHG) emissions, the country’s Draft National Climate Change Framework Policy notes that a significant number of priority development initiatives will impact on the country’s levels of emissions. In collaboration with development partners, the country is already investing in increased geothermal electricity in the energy sector to counter this situation, switching movement of freight from road to rail in the transport sector, reforestation in the forestry sector, and agro-forestry in the agricultural sector. “With a legal framework in place, it will be possible to increase such projects that are geared towards mitigating and adapting to the impacts of climate change,” said Dr Wilbur Ottichilo, a member of parliament for Emuhaya constituency in Western Kenya, and chair of the Parliamentary Network on Renewable Energy and Climate Change, . The Climate Change Bill seeks to provide the legal and institutional framework for mitigation and adaption to the effects of climate change, to facilitate and enhance response to climate change and to provide guidance and measures for achieving low carbon climate-resilient development. U.S. Senator Jon Tester successfully included his bill to increase geothermal energy development on Montana's public lands into a major bipartisan energy package. Tester's Geothermal Energy Opportunity (GEO) Act would allow oil and gas developers on public lands to also harness geothermal potential without having to go through a lengthy approval process. The bill would also establish a national goal of producing 50,000 MW of geothermal power by 2025. "If we're serious about increasing America's energy independence, we must get creative," Tester said. "Tapping Montana's geothermal resources and investing in geothermal research and development will broaden our energy portfolio and create jobs. I'm pleased this bill is moving forward." The bipartisan energy package announced by Senators Lisa Murkowski (R-Alaska) and Maria Cantwell (D-Wash.) yesterday also includes permanent reauthorization of the Land and Water Conservation Fund and Senator Tester's Making Public Lands Public Act. The bill currently sits in the Energy and Natural Resources Committee. Lacking fossil fuels of its own, Japan has always wrestled with energy policy, but the public’s desire to abandon nuclear power in the wake of the 2011 Fukushima disaster has made the challenge even more severe. The government wants to increase renewables from 10 per cent of its energy mix to 24 per cent by 2030, further reducing its reliance on gas, coal and nuclear. Japan suffers from frequent volcanic eruptions, but volatile tectonics also mean geothermal power. Geothermal is almost carbon free and when the steam is easy to find it produces cheap electricity. After a 20-year lull, new geothermal plants are under construction. Idemitsu Kosan is adding 5 MW of geothermal capacity at an existing plant in Kyushu, while a consortium headed by J-Power is building a new 42 MW geothermal facility in the northern province of Akita. But geothermal produces a tiny fraction of Japan’s electricity and analysts are not optimistic that it will ever be much more. “We have 30 GW of potential but most of the resources are located in national parks,” says Mr Shibata. What is more any hint of using them produces a fierce backlash from hot spring resorts who think power stations will steal their hot water. Officials at the industry ministry are promoting research into deep geothermal power, found kilometers underground, but it will take costly exploration and drilling. 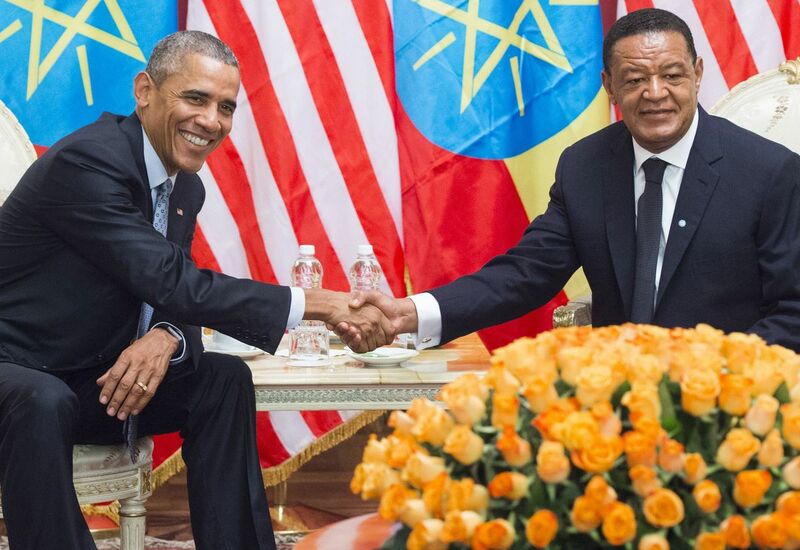 During United States President Barack Obama’s historic visit to Ethiopia, the Ethiopian government and the US-Icelandic Firm Reykjavik Geothermal signed a construction agreement on Monday to kick off the first 500 Megawatt (MW) phase of the 1,000 MW Corbetti Geothermal Project. Today, the Ethiopian government and Reykjavik Geothermal are expected to sign an agreement to launch the second, 500 MW, phase of the geothermal project. The whole project is expected to take 8 to 10 years to complete. Edward Njorge from Corbetti Geothermal Project said Monday that, after tough negotiations they agreed on all terms, making for a good business deal, while boosting the country’s renewable energy endeavour. August 18-19 at the U.N. ECLAC Headquarters, Raúl Prebisch Auditorium, Av. Dag Hammarskjöld 3477, Vitacura, Santiago de Chile. The MIT Sloan Latin America Office is partnering with the United Nations Economic Commission for Latin America and the Caribbean to host a regional conference on energy game changers and the future of energy in Latin America, which is carried out in the framework of the UN Secretary General’s initiative “Sustainable Energy for ALL” (SE4ALL). Energy is essential to the region’s economic growth and social development. The goal of the conference is to jump start the dialogue between MIT academics, policy makers, and industry leaders to change the future scope of energy in Latin America. "....We’re going to continue working together to advance Ethiopia’s economic progress. Ethiopia has one of the fastest-growing economies in the world and one of the largest economies in Africa. And we want to sustain that momentum, because a growing and inclusive economy in Ethiopia means more opportunities for the Ethiopian people and more trade and investment between our nations, which, in turn, helps to create American jobs." "With the renewal of the African Growth and Opportunity Act, we’ll work to further open American markets to Ethiopian products and help expand private sector investment in Ethiopia. Through our Power Africa initiative, we’re working to unlock Ethiopia’s potential for geothermal energy with the nation’s first private sector energy agreement. And this will help the government meet its ambitious goal of significantly increasing access to electricity across Ethiopia and help open the market to developing Ethiopia’s other vast renewable energy sources." Declaring it a moral imperative, California’s leading figures have embarked on a crusade to “decarbonize” the state, sharply reducing emissions of gases they say threaten to wreak havoc, even extinction, on the globe’s human population. A first-stage decarbonization program is underway. But Brown and other political figures, such as Kevin de León, the president pro tem of the state Senate, want California to set a global example over the next 15 years by reducing petroleum consumption in cars and trucks by 50 percent, making buildings more energy-efficient and increasing electrical production from renewable sources – solar, wind and geothermal – from 33 percent, the current goal, to 50 percent. De León is carrying Senate Bill 350 that would implement those goals. How will those ambitious goals be met, and at what cost? 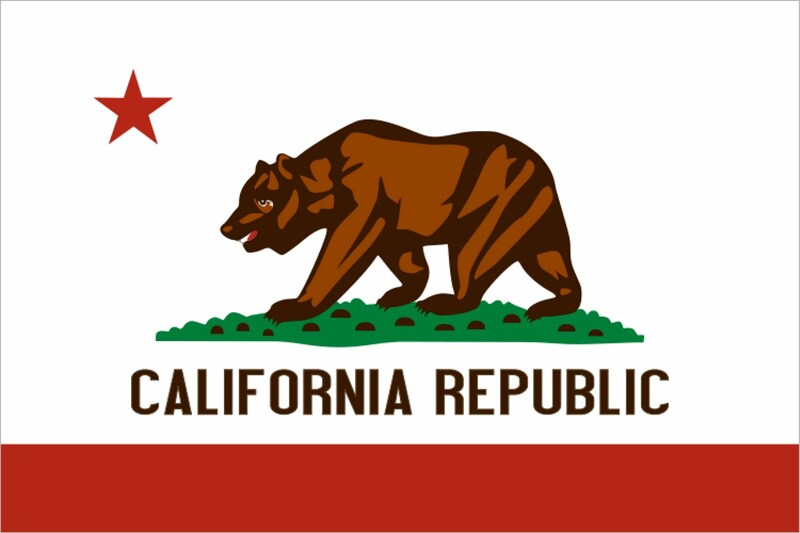 Will decarbonization be the economic boon that Brown and others envision, or will it make California less attractive for job-creating investment? Will it have a trend-setting effect on global carbon policy, or be ignored by the rest of the world? Does it even go far enough? The purpose of this workshop is to ask for your input regarding the potential for geothermal direct use applications in the Eastern United States. While the entire Eastern U.S. will be discussed, the Appalachian Basin including NY, WV, and PA will feature prominently. Direct use geothermal energy applications in this region could diversify energy supplies and contribute to net-zero energy goals. This workshop will provide a forum to exchange information on low temperature geothermal applications. To that end, participants will be asked to provide recommendations and information based on personal experience, individual advice, information, or facts regarding this topic. The objective of the workshop is not to obtain any group position or consensus; rather, the DOE is seeking as many recommendations as possible from all individuals at this meeting. Ethiopian Electric Power and the Corbetti Geothermal Company have signed a Power Purchase Agreement for the first 500 MW. The 1,000 MW Corbetti geothermal plant will be built in two stages within 8 to 10 years. Upon completion, it will be Africa’s largest geothermal facility. The Corbetti Geothermal Power Project -- located 200 kilometers (124 miles) south of the capital Addis Ababa -- will be built in two phases, with the first 500 MW phase to be completed in 2018. The second phase is expected to be finished in 2021. Working alongside development partners, led by the World Bank Group, GEOLAC 2015 will gather key stakeholders - governments, utilities, multilaterals, developers, capital providers, and other providers of expertise - to explore opportunities for increased geothermal output, tackle obstacles to development, promote the exchange of knowledge and expertise, and facilitate vital new meetings and relationships. As the lithium-ion battery market heats up, developers are seeing exciting opportunities to extract sought-after lithium from spent geothermal brine. Lithium is commonly extracted from either hard rock via an energy-intensive roasting and leeching process, or from salty brines. The brine is laid out in pools where it evaporates, leaving behind lithium and other minerals. Though it is relatively low-cost, the evaporation process can take up to two years and it is difficult to get most of the lithium out of the brine. In order to avoid this process, some developers have turned to the Salton Sea in Imperial Valley, California, which sits on a massive geothermal resource. If developed, it could potentially unlock nearly 3 gigawatts (GW) of capacity. Developers have taken notice, and the Imperial Irrigation District has created a plan to develop 1.7 GW by 2032 - if they can get some financial backing. While it sounds like a no-brainer, the project faces several hurdles, including a lack of transmission and long permitting processes. Two potential geothermal energy projects near Pemberton, near Whistler in British Columbia (B.C.) could generate electricity for about seven cents a kilowatt hour — only slightly higher than the 5.8 cents to 6.1 cents a kilowatt hour cost estimate of the Site C dam project. That's the conclusion of a recent Kerr Wood Leidal Associates study on the economic viability of geothermal resources in B.C., which considered nine of the most favorable geothermal sites in the province. There are no geothermal energy projects operating in B.C. but the study estimated the cost per kilowatt hour for the nine sites would range from 6.9 to 7.1 cents for Pebble Creek and Meager Creek near Pemberton to 17.6 cents for Clarke Lake near Fort Nelson. U.S. Geothermal Inc. has announced that its subsidiary, U.S. Geothermal Guatemala, S.A., received final notification that the modified schedule for the El Ceibillo project was approved by the Minister of Energy and Mines. Notification of the approval by Ministerial Agreement was received on Tuesday, July 21.
occurring during the second quarter of 2018. Preparations are underway to restart the drilling program. The first activity planned will be the drilling of well EC-2. Mexico's energy ministry last week awarded five geothermal concessions and 13 permits for exploration to national power utility Comision Federal de Electricidad (CFE). The company will study geothermal resources for 448 MW in the states of Baja California, Michoacan, Nayarit and Puebla, while the five reserved fields are Cerro Prieto, Tres Virgenes, Los Azufres, Los Humeros and Cerritos Colorados, located in Baja California, Baja California Sur, Michoacan, Puebla and Jalisco, respectively. The assigned areas allow the company to increase its geothermal power output by 50%. Also, private investors will have the opportunity to develop some 5,000 MW of probable geothermal resource in the country, according to deputy minister of planning Leonardo Beltran. The private sector could form alliances with CFE too. The answer to Earth’s energy crisis could lie a few thousand feet beneath the planet’s surface. Here, scientists are hoping a nearly limitless amount of geothermal power will provide enough energy to replace Earth’s rapidly depleting fossil fuel resources. But harnessing this renewable energy source is currently a slow and expensive process, with costs ranging from $5 million to $20 million. Now one company believes it has a solution; repeatedly firing projectiles at 4,500 mph (2 km/s) to blast deep holes in the ground. Washington-based drilling technology company HyperSciences, has been awarded a patent on a new type of ram accelerator funded by a $1 million grant from oil company Shell. The latest patent details a system in which ‘bullets’ would fire at high velocity causing whatever is in its part to vaporize. 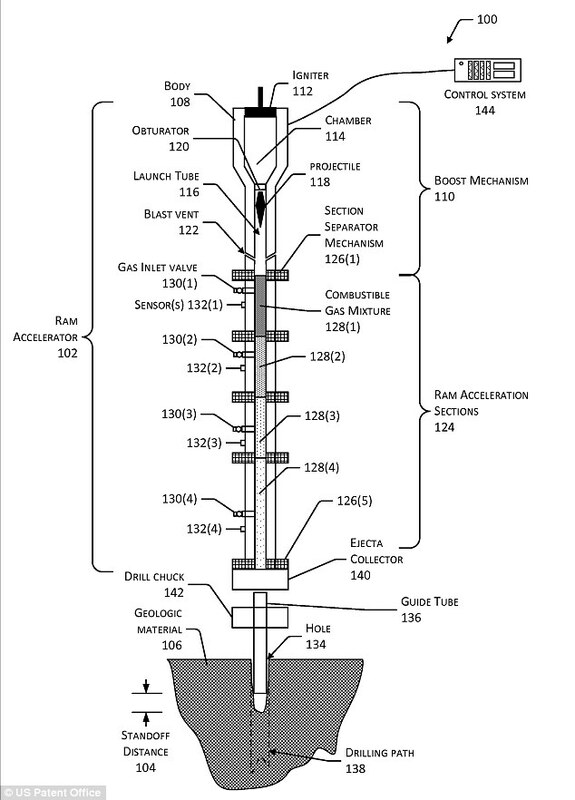 The ram accelerator in this design serves as both the chamber and barrel of this ‘Earth gun.’ Gas is pumped in and then ignited pushing the bullet forward at speeds of up to 4,500 mph (2 km/s). The company hopes the 'gun' could be used to reach geothermal resources at depths up to two miles, by being fired repeatedly. Tamara Babayan, the director of the Renewable Energy and Energy Efficiency Fund, has announced Friday, July 24, the launch of a $58 million worth investment project designed to help advance Armenia’s renewable energy sector, Arka reports. One of the project’s components is geothermal exploratory drilling in the southern Armenian province of Syunik to explore the geothermal energy potential. Before the winter, a road will be built to the drilling site, Babayan said. The project is being implemented by the Renewable Energy and Energy Efficiency Fund with the support of the Climate Investment Fund, the Ministry of Energy and Natural Resources, the World Bank and the Asian Development Bank. The Clean Energy Patent Growth Index (CEPGI), published quarterly by the Cleantech Group at Heslin Rothenberg Farley & Mesiti P.C. provides an indication of the trend of innovative activity in the U.S. Clean Energy sector. Results from the first quarter of 2015 reveal the CEPGI to have a value of 851 granted U.S. patents, which is the fifth highest total for any quarter on record with the other top four all occurring within the prior year and a half. Geothermal patents (5) are up two compared to the fourth quarter but down one compared to the same quarter a year prior. Provide geothermal exploration test projects a limited categorical exclusion provided the lands involved present no extraordinary circumstances. Istanbul-based Turcas Petrol aims to start producing electricity from geothermal energy in 2017 as part of the company's joint long-term transformation strategy with Azerbaijan's Azalternativenerji to invest in renewable energy both in Turkey and Azerbaijan, Turcas Petrol CEO Batu Aksoy said. A recent statement released by Turcas Petrol through the Public Disclosure Platform (KAP) on July 21 said the company signed a good-will agreement with Azalternativenerji, which operates within the body of Azerbaijan's State Agency on Alternative and Renewable Energy Sources (SAARES), with the objective of cooperating and developing joint projects to invest in power plants that are based on solar and wind energy and geothermal resources in Turkey and Azerbaijan.